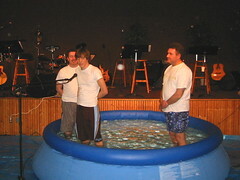 Southworth Sailor: "Whoever professes me before men"
It was our priviledge to witness Markus' baptism this afternoon. We were happy that Pastor John Snell was able to participate, as he has had a major spiritual impact on Markus the last six years as his youth pastor. This is a monumental day for the Bulthuis boys as Bjorn turned 21 today. Unfortunately, he was not able to be with us today, but he will spend next weekend with us at Big White Ski Resort. Yeah, way to go Markus. BTW, I think Bjorn is having a good birthday, considering he doesn't get to be with his family. He's out with the guys from his house (+ Boone) in Lyden, celebrating @ Bob's Burger Bar (is that the right name?! haha) right now!